Tech firms move to put ethical guard rails around AI, Tom Simonite, Wired, May '18. Intelligence artificielle: Microsoft ne veut pas fournir d’outils qui pourraient violer les droits de l’homme, Morgane Tual, Le Monde, July '18. Training Algorithms to Prevent Death Spirals in Hospitals: Tech companies and universities are building early warning systems for patient fatalities, Dina Bass, Bloomberg, June '18. A New Way for Machines to See, Taking Shape in Toronto, Cade Metz, NY Times, Nov. '17. On Cortana Commitments effort, Matt Weinberger, Business Insider, Feb '17. Intelligent Machines Tech Giants Grapple with the Ethical Concerns Raised by the AI Boom: As machines take over more decisions from humans, new questions about fairness, ethics, and morality arise, Tom Simonite, MIT Technology Review, March '17. Scientists use Microsoft Bands and Bing to link lack of sleep to cognitive impairment, Alan Boyle, GeekWire, Jan. '17. The Government Isn’t Doing Enough to Solve Big Problems with AI, Mike Orcutt, MIT Technology Review, Dec. '16. A 100-year study of artificial intelligence? Microsoft Research’s Eric Horvitz explains, Jia You, Science, Jan '15. Is it cancer? Diagnosing yourself online is about to get easier, Kevin McCarthy, The Guardian, July '16. Microsoft Finds Cancer Clues in Search Queries, John Markoff, NY Times, June '16. Second-opinion software: Microsoft’s Eric Horvitz on how AI can save patients’ lives, Alan Boyle, GeekWire, June '16. Artificial intelligence takes to the skies, Phys.Org, June '14. Can robots have social intelligence?, Phys.Org, June '14. Software Predicts Tomorrow’s News by Analyzing Today’s and Yesterday’s, Tom Simonite, MIT Technology Review, Feb. '13. Unreported Side Effects of Drugs Are Found Using Internet Search Data, Study Finds, John Markoff, NY Times, March '13. Some high-level coverage of efforts on predictive models for readmissions in healthcare, Fast Company, July-August '12. Distracted Driving: An Answer Perhaps?, Steve Lohr, New York Times, May '11. Google and Microsoft Talk Artificial Intelligence, Tom Simonite, MIT Technology Review, Nov. '11. NPR story on long-term futures for machine intelligence, All Things Considered, January '11. Ability to 'see' advances artificial intelligence, James Temple, San Francisco Chronicle, October '10 (team photo). Computers Learn to Listen, and Some Talk Back, Steve Lohr and John Markoff, New York Times, June '10. To Win Over Users, Gadgets Have to Be Touchable, Claire Cain Miller, New York Times, September '10. How Microsoft Research foresaw Google's 'Priority Inbox' feature, Todd Bishop, TechFlash, September '10. Scientists, lawyers mull effects of home robots, Brooke Donald, Associated Press, December '09. A glut of Google can give you a virtual fever, Carolyn Butler, Washington Post, November '09. Deep Data Dives Discover Natural Laws, Gary Anthes, Communications of the ACM 52:11, November '09. Futurists' report reviews dangers of smart robots, Mike Cronin, Tribune Review, November '09. Surprise Modeling, Mitchell Waldrop, Technology Review, Ten Emerging Technologies, March 2008. Microsoft Introduces Tool for Avoiding Traffic Jams , John Markoff, New York Times, April '08 (article on Clearflow project, basis of traffic-sensitive routing for 72 North American cities at http://maps.live.com). Six Degrees of Messaging, Katharine Sanderson, Nature, March '08. Results also discussed in articles in Washington Post and Wall Street Journal, with video discussions on CNBC and ABC. Microsoft Examines Causes of ‘Cyberchondria’, John Markoff, New York Times, Nov '08. Microsoft aims to turn PCs into personal assistants, teachers, Byron Acohido, USA Today, March '09. NPR Radio Discussion on E-Health, The Diane Rehm Show, December '08. NPR Radio Discussion on Machine Intelligence and Personal Assistance, NPR Weekend Edition, March '09. Minds, Machines, and Intelligence: A Conversation, Behind the Code series, Research Channel and MSDN Channel 9, February 2009. IBM, Intel, And Microsoft Tout Technology Future , Thomas Claburn, Information Week, April '07. Links to streaming video of the Gartner panel on innovation: initial portion (CNET) and whole session (Gartner). A.I. Reboots, Michael Hiltzik, MIT Technology Review, March '02. Some Vista, Office Innovations Spring from MS Research , Peter Galli, eWeek, January '07. Microsoft Sees Software Agent as Way to Avoid Distractions, John Markoff, New York Times, July '00 (article on Notification Platform and overall Attentional User Interface (AUI) project). Microsoft demos robotic receptionist, Ina Fried, CNET, July 2008. Microsoft Predicts The Future With Vista's SuperFetch, Gregg Keizer, Information Week, January '07. Intelligent software aims to give users peace of mind, Todd Bishop, Seattle Post-Intelligencer, March '05. Got a minute?, Alison Motluk, New Scientist, June '06. Charlie Rose Show: A Conversation about Artificial Intelligence, PBS Network, December 21, 2004. (Youtube version). Considerate Computing, Wayt Gibbs, Scientific American, January '05 (article reviewing Notification Platform and Bestcom projects). Electronic map keeps drivers away from jams, Celeste Biever, New Scientist, October '06. Microsoft software aims to predict traffic, Ellen Liang, King5.com, May '06. AI's Next Brain Wave: New research in artificial intelligence could lay the groundwork for computer systems that learn from their users and the world around them., Aaron Ricadela, Information Week, April 2005. PC, leave me alone – I’m busy, Danny Bradbury, Financial Times, April 2006. Viaje al futuro: Microsoft - El cerebro que nos cambió la vida , David Dudster, El Magazine, March 2007. Getting out from under: Beset by interruptions, information overload, and irksome technology, knowledge workers need help. A survival guide., Ellen McGirt, Fortune Magazine, March 2006. Emerging Technology: How to cut through the info blitz and actually get some work done, Discover Magazine, November 2005. Bill Gates Talks Seamless Computing, Information Week, December 2003. Awarding the Brains Behind AI, InformationWeek, October 2004. 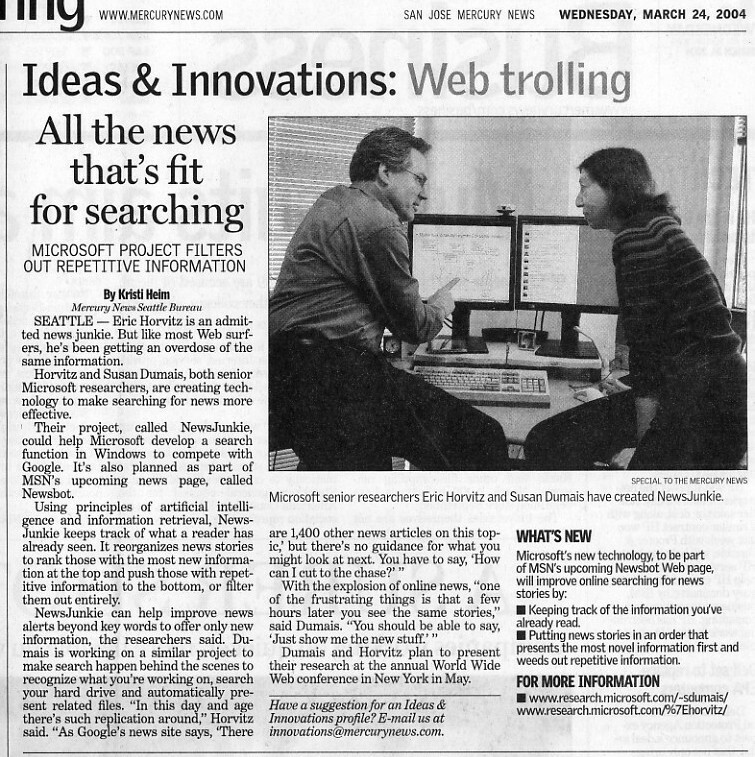 TechFest brings Microsoft's researchers and projects together, Todd Bishop, Seattle Post-Intelligencer, March '05. 18th-century theory is new force in computing, Michael Kanellos, CNET News, Febrary '03. Microsoft Shows Digital Message Filtering, Stephen Buel, Techweb News, March 2001. Search for Tomorrow, Joel Achenbach, Washington Post, February '04. Microsoft is Calling You, Phil Harvey, Red Herring, June '00 (article on Priorities and Notification Platform projects). 10 Emerging Technologies That Will Change Your World, Technology Review, February 2004. Anticiparallelism (aka Continual Computation). Gary Anthes, Computerworld, January 2002. From the Ether. Bob Metcalfe writes on some of his long-term and more recent passions, including continual computation. AI by another name, Economist, March 2002. Technically Speaking . William Van Winkle, CPU, March 2004. Power to the PC: Microsoft and others are betting that users want products that combine the speed of local computing with new Web services, Aaron Ricadela, Information Week, January 2001. Microsoft Invests in Mathematicians, Allyn Jackson, Notices of the American Mathematical Society, June-July 1998. Artificial intelligence isn't just a movie, Kevin Maney, USA Today, June 2001. Mobile Manager has an almost telepathic ability to distinguish junk mail from genuinely important messages, Economist, March 2001. High Anxiety, Computer Business Review, January 2000. Sensitive Phones, MIT Technology Review, March 2002.